We consider the problem of verifying liveness for systems with a finite, but unbounded, number of processes, commonly known as parameterised systems. Typical examples of such systems include distributed protocols (e.g. for the dining philosopher problem). Unlike the case of verifying safety, proving liveness is still considered extremely challenging, especially in the presence of randomness in the system. In this paper we consider liveness under arbitrary (including unfair) schedulers, which is often considered a desirable property in the literature of self-stabilising systems. 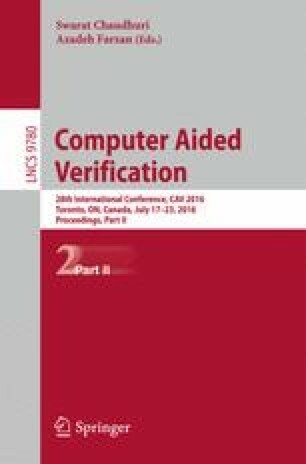 We introduce an automatic method of proving liveness for randomised parameterised systems under arbitrary schedulers. Viewing liveness as a two-player reachability game (between Scheduler and Process), our method is a CEGAR approach that synthesises a progress relation for Process that can be symbolically represented as a finite-state automaton. The method is incremental and exploits both Angluin-style L*-learning and SAT-solvers. Our experiments show that our algorithm is able to prove liveness automatically for well-known randomised distributed protocols, including Lehmann-Rabin Randomised Dining Philosopher Protocol and randomised self-stabilising protocols (such as the Israeli-Jalfon Protocol). To the best of our knowledge, this is the first fully-automatic method that can prove liveness for randomised protocols. We thank anonymous referees, Parosh Abdulla, Bengt Jonsson, Ondrej Lengal, Rupak Majumdar, and Ahmed Rezine for their helpful feedback. We thank Truong Khanh Nguyen for contributing with the development of the tool parasymmetry , on top of which our current tool (SLRP) builds. Lin is supported by Yale-NUS Grants, Rummer by the Swedish Research Council.